It was determined that the RS-68 would not survive the thermal environment of the proximity to the SRBs long enough to even reach MECO. Providing a regen nozzle for the RS-68 was not an option per USAF sources. Therefore the RS-68 was dropped from consideration and replaced with the RS-25, the next best option. 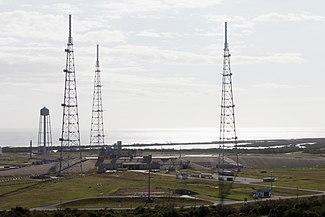 Is the Mobile Launcher Platform for the SLS called MLP-4? *edit* it looks like it's called ML-1. Back to the old Apollo nomenclature, I guess. Is there any Composite Overwrapped Pressure Vessels(COPV) used on SLS? iCPS/DCSS uses a bunch of them for pressurant and attitude control propellant. EUS will use them as well, though its looking like they may go with IVF for those systems and only need a couple COPVs for storing high-pressure boiloff gas. AFAIK the core stage will use COPVs for pre-ignition tank pressurization as well, the same as on the Shuttle. Could (ignoring the politics) the SRB's be replaced with 4 falcon 9 boosters?I was doing the math and 4 falcon 9 boosters would have just as much force as 2 SLS SRB's but I don't know if they would be reusable considering the speed they will be going at sep.Plus the power to weight ratio compared to SRB's. There is no strife,no prejudice,no national conflict in space as yet.Its hazards are hostile to us all. No, for many reasons. Politically it would be a non-starter (and SLS is a very political beast). Plus rockets aren't LEGOTM Elements and the resultant rocket would need substantial reevaluation, plus many components would need to be redesigned. Not to mention the "why bother?" aspect. Falcon 9 excels in two domains: Reuseability and price. But neither really help here: The cost of the design change would outweigh any benefit from having cheaper boosters, and reuseability is a moot point when SLS will have a flight rate of (at most) two per year, which won't be improved by the change (since solid rockets aren't the bottleneck in SLS's flight rate). All that said, when NASA requested proposals for boosters for SLS, there was a proposal called Pyrios using liquid-fueled boosters and redesigned F1 engines. EDIT: Chris Bergin did an excellent article on the proposal here that has a lot more details than the Wikipedia article linked above. 1) the core stage to accept thrust from 4 attach points to the thrust beam, and to avionics to control the boosters. 2) the booster structure to support the core on the ground and to lift from the top (FH boosters lift from the bottom). 3) the VAB bay and MLP for the new engine locations, new holddowns, and to supply RP-1. 4) NASA's risk assessment policy about flying 40 engines on a single rocket. So if you change almost everything, sure. It could be done. Would it be cheaper or faster? Almost certainly not, at this point. SLS can only fly about twice a year because the entire infrastructure is set up for that and increasing that would cost tens of billions aside from the boosters. Reuse isn't worth it for 2 flights a year. I would remove the SRB beam and add core support to the ML, since the thrust beam has to modified already. Out of technical curiosity, and in the light of the recent reported delays, a few SLS software technical avionics questions please. Some searching on this site, and Googl'ing, did not turn up the answers I was hoping for. Hence, any insights and pointers in the right direction would be appreciated. PS: I hope the Q&A thread is ok for this as I could not find an avionics discussion thread. sort of relevant...yikes if true.. "....The SLS software team at MSFC is having great difficulty in hiring people to replace those who have quit. There is a lot of internal concern as a result of issues already raised with regard to SLS software safety to date that MSFC will literally have to go back to square one on software so as to verify it for use on human missions." 3) Has the SLS avionics been written from scratch, or partial re-used from the Shuttle software stack? I believe  might be a partial answer but it does not say whether the Ares stack was based on the Shuttle legacy software. Hence the question, thanks. 4) What is the size of the SLS avionics software stack in relative terms to other avionics stacks of older rockets, shuttles or planes? Same size? Much bigger/smaller? 5) Assuming ADA was used, what would be the technical requirements these days to make a choice for ADA over C++? Although I am deeply familiar with embedded C/C++ real-time software in production environments and how to make it fast, reliably, extensible, maintainable, and responsive on modern hand-held devices, my ADA experience is much older. ADA was conceived in the 70s and to include tools like, e.g., TASKS for multitasking. The C++11 mutex as well as low overhead threads/pthreads in C/C++ are from a later date but which the same objective. Therefore, I am honestly curious whether these days there are still technical considerations to prefer ADA over C/C++ for avionics? Any insights? I have some questions relating to version of SLS and the MLs they will launch from. EM-1 is launching Orion atop SLS Block-1 from ML-1, ML-1 will then be modified for SLS Block-1B Cargo usage. ML-2 will be built for SLS Block-1B Crew from the get-go. So after EM-1 and modifications, ML-1 will be used for Block-1B Cargo and ML-2 for Block-1B Crew. I have read that ML-2 would be then further modified for SLS Block-2 missions, if that ever happens. 1) Does that mean that once SLS has entered the Block-2 configuration, that only ML-2 is to be used for both SLS Block-2 Crew and for SLS Block-2 Cargo configurations? 3) Perhaps I am getting ahead of myself here, but I'm assuming Block-2 Crew and Block-2 Cargo would require different ML's. Can SLS Block-2 Cargo and Block-2 Crew be launched from the same ML? Article by Chris Gebhardt, dealing with ML's and Europa Clipper scheduling. I remember the talk of a "Competition" for the Advanced Boosters but I read at least 2 papers in which NASA stresses that it want to to protect its "US$300 million investment in Utah". 1. NASA isn't sure they will build a second ML. Also, Block II is kinda a dream at this point, IIRC they haven't even decided on what boosters to use. 2. Refer to Q1, Block II is just a dream at this point. 3. SLS crew and cargo variants can almost certainly launch from the same ML, they might just need a new umbilical arm to power the payload, but that's really it. The Crew Access Arm and the service module arm(s) can just be retracted out of the way. Prior to EM-1, will we see some sort of a Test Article be stacked in the VAB atop ML-1 then be moved to LC-39B? If not, what is planned? I believe the Core Stage Pathfinder will be stacked on the ML, but nothing else with it. I don't know if it will go out to 39B, and take what I said here with a grain of salt, I think this may be old info and could be incorrect. Doesn't the core stage require the SRBs to be stacked first in order to remain upright? Or will it be placed on custom GSE? Thanks, I must have misread something somewhere. It will pretty much do what the orbiter mock-up Pathfinder did when it was at KSC, check out the facilities but not go to the pad. So the first time the RSS was closed around a stack, a stack of flight hardware was in place? That's interesting, esp. considering the Vandenberg fit check with Enterprise. I have to remember that there will be no FSS at the pad and that the Launch Umbilical Tower(LUT) or whatever the proper term is for that steel gantry atop ML-1 for SLS, will all be fitted within the VAB. But this picture is labelled "Enterprise at pad 39-A in 1979 at KSC", now I'm confused. OK, as of September 2017, 39B is a pretty "clean" pad. The Saturn-V used a "Fixed Service Structure"(FSS) aka "Launch Tower", formally aka the "Launch Umbilical Tower"(LUT) and a Mobile Service Structure(MSS) as pictured below in picture #2. The Saturn-V FSS is attached to the stack in the VAB atop a Mobile Launcher, and a Crawler Transporter(C/T) carries the stack to the pad, sets it down atop the holddown posts and then retreats. The MSS is then positioned directly across from the FSS thus encapsulating the stack, the MSS is withdrawn prior to launch. Then once we got into the Shuttle era, a Rotating Service Structure(RSS) was employed at LC-39-A&B. Which included a cleanroom into which the Orbiters payload bay could be accessed and cargo loaded. Following RSS retract as pictured in my 4th image, "The Angels wings have unfurled allowing the beauty within to strive for the Heavens." Who says iron and fire isn't a spiritual experience? Will the the SLS stack once at the pad for launch use a MSS similar to the Saturn-V/Apollo setup? 3) A Saturn-V launching during Apollo-4 in November 1967. As we can see the MSS is not in frame, FSS is present with umbilical disconnected and withdrawing. 4) OV-Columbia sitting prior to STS-1 with the Rotating Service Structure withdrawn/open prior to launch in April 1981. This is Pathfinder at KSC. First photo shows Pathfinder arriving at KSC on its trailer. Second photo shows the MDD being checked out while the third shows Pathfinder vertical in the VAB transfer aisle.